Happy October guys, hope you all had a lovely weekend. 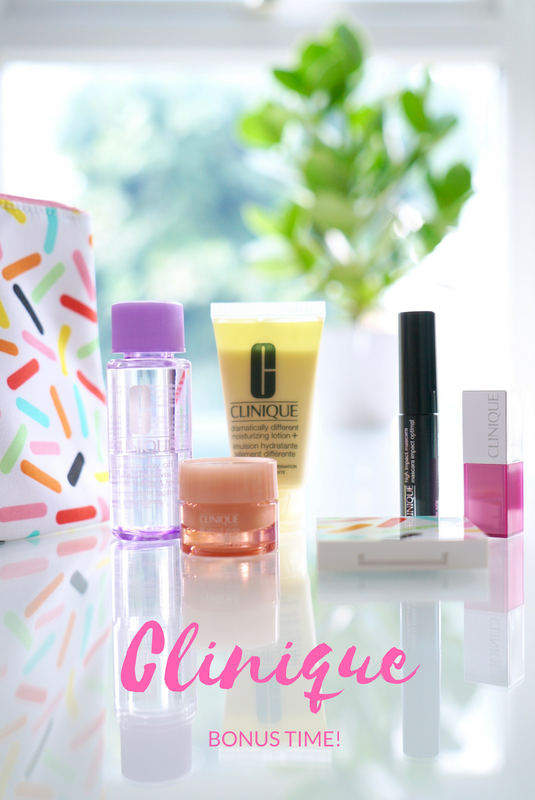 I've got a beauty post to share today featuring the popular Clinique Bonus Time. 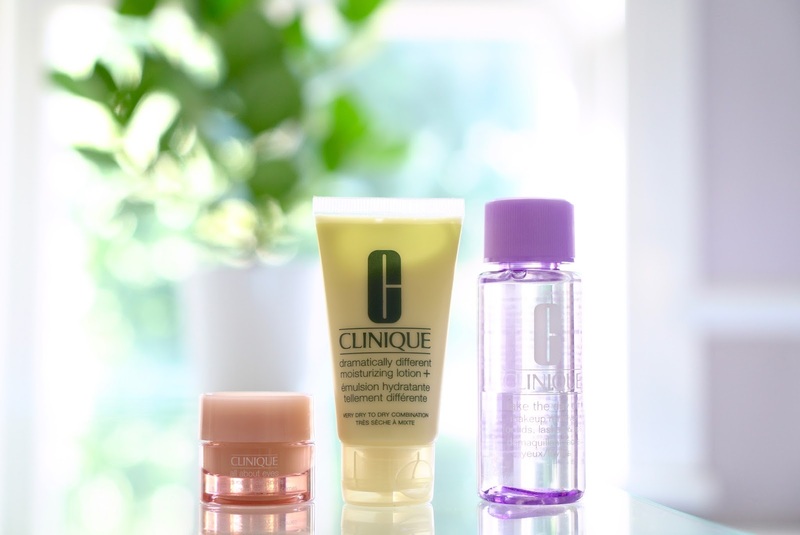 If like me you like a good beauty freebie then I think you'll love the gift with purchase Clinique* are currently running at Debenhams - it's a good one! 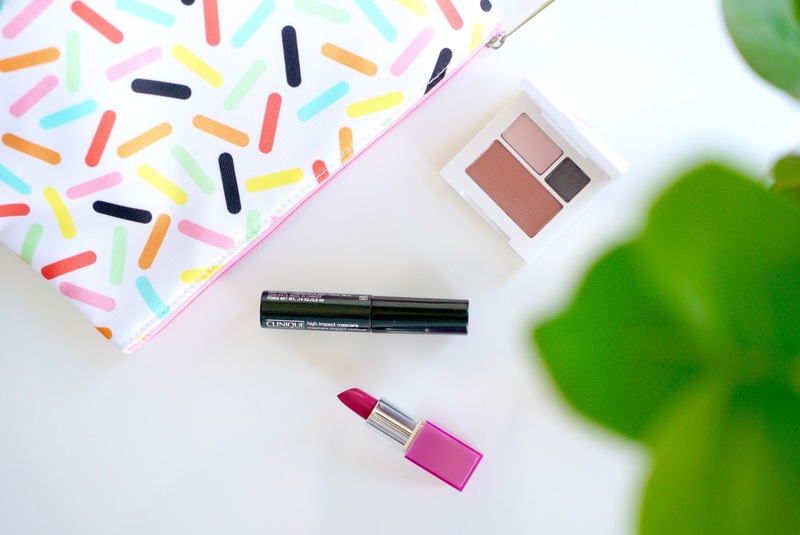 The cute and colourful makeup bag includes 6 sample size beauty products including some of their classics as well as a limited edition eye shadow and blusher set. The promotion is running until the 22nd October in the UK, great for a gift or a treat for yourself :) OK, let's have a look inside the bag! 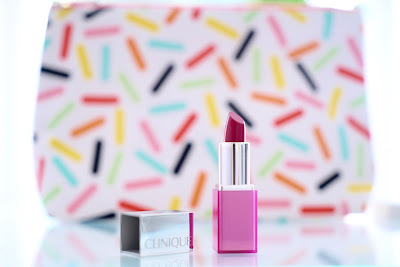 Clinique is such a classic beauty brand, one of the first high end brands I started using in my 20's. I must admit I don't use many of their items now but I was pleased to see 3 of their cult classic skincare products, you can't go wrong with an eye cream, face moisteriser and makeup remover. Here's a quick review of the products. One thing I never skip from my skincare routine is an eye cream, I'm obsessed with keeping the under eye area moisterised and prevent dark circles and fine lines. I've used Clinique All About Eyes before and the consistency is bang on - can't fault this cream. It's fragrance free, lovely texture - not to heavy and thick (Kiehl's Avocado Creamy Eye Cream is too thick for me and doesn't blend is as well.) This eye cream is a great all rounder and feels nice and smooth under the eyes. I would happily repurchase the full size. Another classic product is their Take The Day Off Makeup Remover Lids Lashes Lips. I wasn't sure I would like this product as it looks like it might be oily on my skin (which is ironic as I use an oil cleanser to remove my makeup!) Anyway I used this to remove my eye makeup and lipstick and although I can feel the product on my skin afterwards, it does get rid of makeup really easily without stinging. This is a good makeup remover if you don't want to faff around with washing your face with a balm etc. The formula is similar to the Lancome eye makeup remover, if you've used that before. It also takes off waterproof eye makeup, which is a must for me! I was pleasantly surprised with the Dramatically Difference Moisturizing Lotion as I thought it would be heavy on my combination skin. Even though this is for very dry skin type, it sunk into my skin effortlessly and left my skin leaving soft and nourished, without a heavy feel. The new formula claims to pack in the moisture and strengthen your skin natural barrier - perfect for the cold season coming up! I was really excited to see the Pop Glaze Sheer Lip Colour and Primer in this gift set, how cute is the packing? This dinky lipstick in the shade Sprinkle is a cool tone pink. 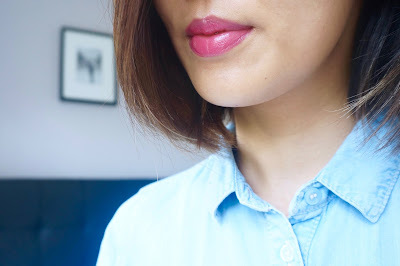 I wear pink all year round so was happy to add this to my collection :) These lippies are bold, weightless and with a built in primer. The formula feels really nice, it's doesn't feel like you're putting anything on your lips! It glides on with it's silky texture and instantly moisturises your lips like a balm, gorgeous. 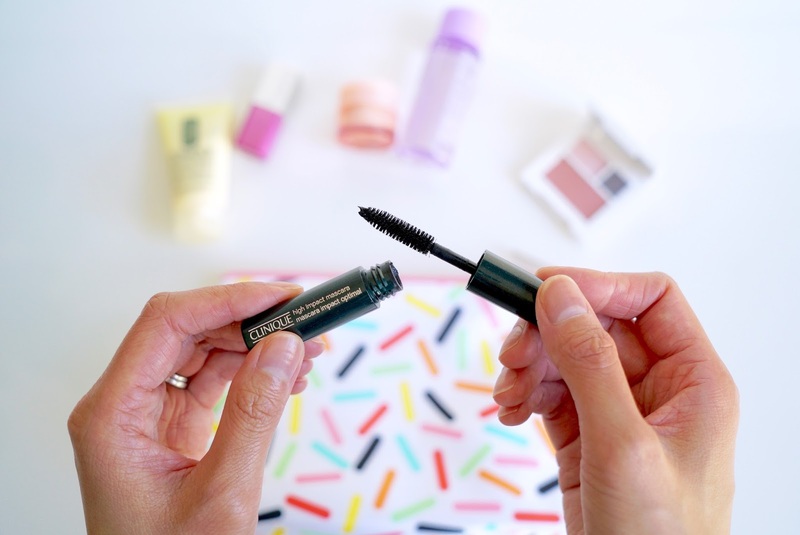 Their High Impact Mascara is another classic product, I like this mascara but I have to say my lashes can't deal with non waterproof formulas (short Asian lashes for you!) They don't stay curled for very long but my colleague swears by this mascara and makes her lashes look super thick and full. 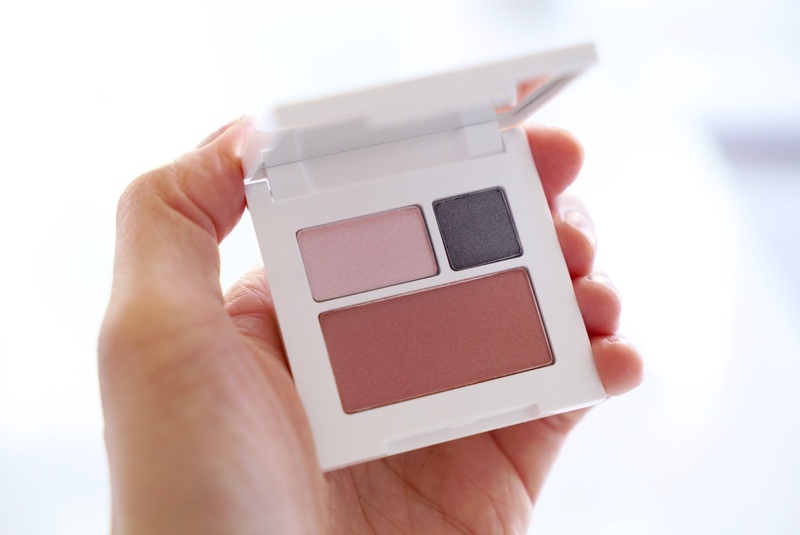 The gift with purchase comes with a limited edition palette featuring the eye shadow shades Uptown Downtown Duo and Blush in Bashful Blush. It's in the same fun print as the makeup bag and I was pleased as I don't have any similar shades to the shadows and blush. The pink eyeshadow is very pale but using the black as a crease creates a nice modern look. They lasted quite well on my lids considering I didn't wear a primer but I don't really suit cool tone shadows! The blush is a dark coral, it's a great shade for Autumn and something different from all the baby pinks I have! I hope you enjoyed this beauty post. You can get this gift set when you buy 2 items from Clinique, one being foundation or skincare. Also if you're feeling spendy, with any third purchase receive a full size 75ml Deep Comfort Hand and Cuticle Cream - I wouldn't mind trying this as my hands are super dry right now! I also like the look of their Moisture Surge Extended Thirst Relief, can you tell my skin needs some moisture at the moment! Let me know your favourite Clinique products? What do you think of the Clinique beauty bag?